This blog post is written by Lale Kuzu, former CCHR International Intern. As a law graduate from the U.K, I have often found observing the hushed stillness of the Court of Appeal as daunting as sitting in a head teacher’s office regardless of whether you are present for discipline or reward. I was struck by that same feeling in the presence of the judges at the Phnom Penh Court of Appeal, with the judges in red robes with silk white neckties seated in grand high chairs peering down at the crowd below it. This feeling of both fear and respect was present until the moment eleven defendants dressed in orange uniforms were escorted through the door, each waiting to be un-cuffed before being seated in the two rows in front of me. The hustle and bustle that accompanied the eleven defendants, with their friends and families in the aisle next to them, prison guards sitting with them and lawyers hovering behind them transported me to a whole new court room. The right to be judged fairly and impartially by an independent court is an absolute right that should never be violated. 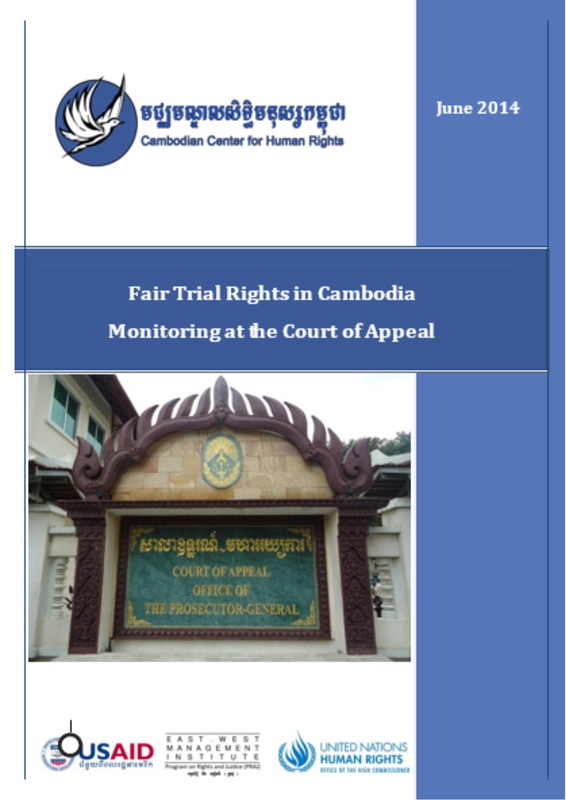 However, in Cambodia fair trial rights have long been an area of concern and with recent legislation having further weakened the independence of the judiciary; a heavy spotlight should be on the courts, judges and prosecutors. CCHR’s Trial Monitoring Project has provided that spotlight since 2009 and has since built a bridge of dialogue between the courts and civil society to address individuals’ rights violations. The report released today by CCHR is the result of data gathered from 204 cases CCHR team monitored at the Court of Appeal in the past year and highlights the challenges individuals face regarding their right to a fair trial.